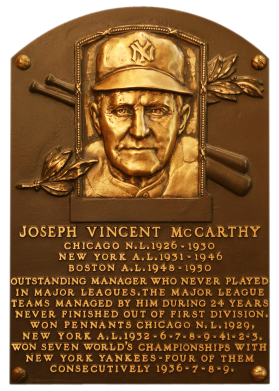 While Joe McCarthy never played a game in the majors, in 24 years as manager he collected seven world championships and nine pennants. His 2,125-1,333 record gives him an all-time best .615 winning percentage. Most of his success came with the Yankees, where he won four straight World Series from 1936-1939. 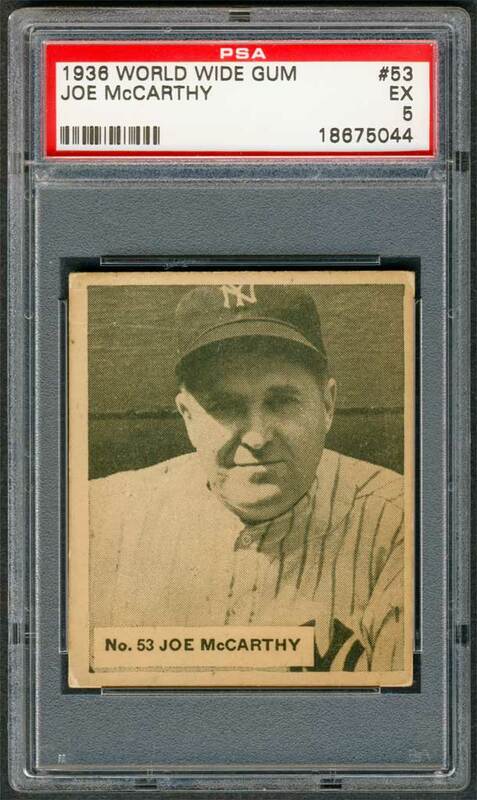 After winning the NL pennant with the Cubs in 1929, McCarthy piloted the Yankees to a pennant in 1932 to become the first manager to win a pennant in both leagues. 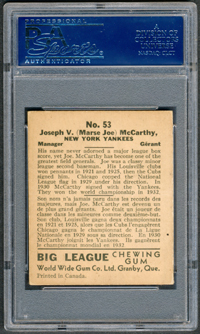 Comments: At the 2004 National Sports Collector's Convention in Cleveland, OH I purchased a raw 1936 World Wide Gum card of legendary Yankee's skipper Joe McCarthy from Irv Lerner (along with a Medwick and Al Lopez). 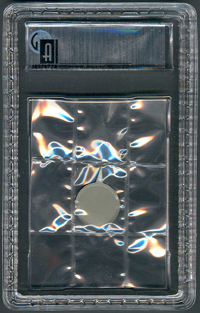 The card was submitted to PSA and graded VG-EX 4. 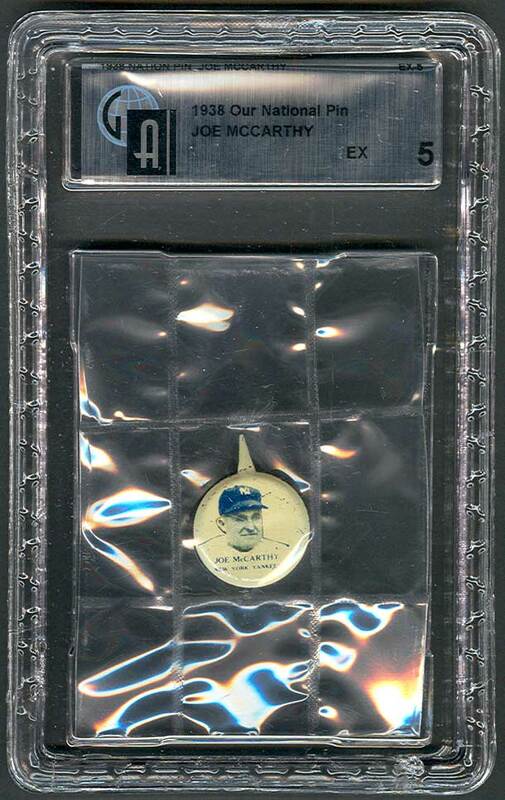 In September, 2007 I picked up a 1938 Our National Game pin graded GAI 5 on eBay from Bruce Cohen (psa-graded-cards). With the pin in the collection, it was an easy decision for me to sell the '36 WWG card when I received an offer I couldn't refuse in October, 2007. 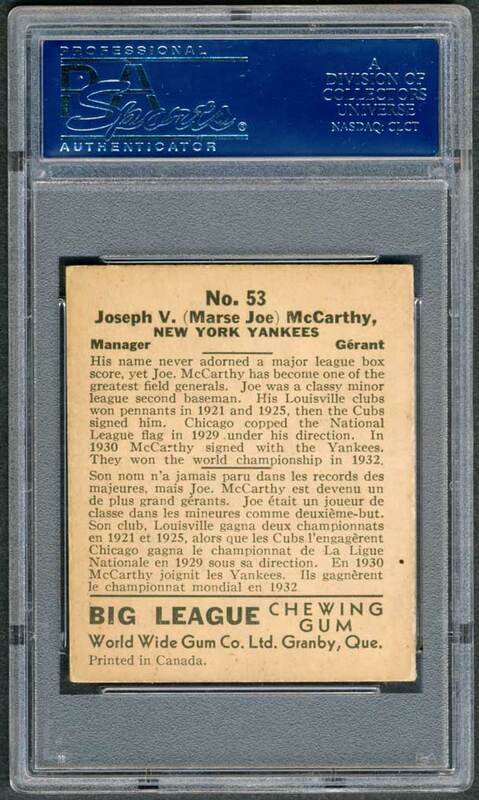 The buyer really wanted to add a baseball card to his HOF collection and McCarthy doesn't have anything else besides the '36 WWG card. It's a tough card. SOLD!!! I ended up buying a couple more of the '38 pins trying to find a nicer example - no luck. But, I missed the card and really wanted to get my hands on another copy. Owning the pins wasn't enough. In September, 2011 the opportunity came up to do just that. 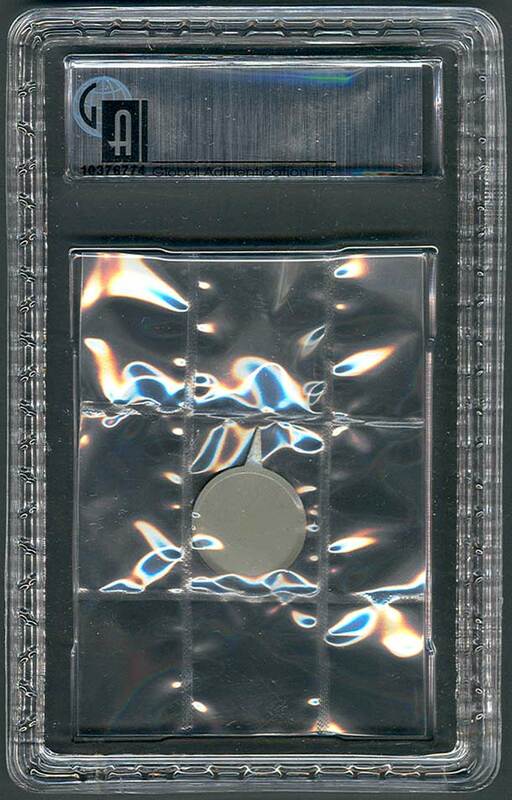 A PSA 5 example showed up on eBay from seller Richard Probstein (probstein123) and I won the card. Description: This unnumbered 30-pin set issued circa 1938 carries the American Card Catalog designation of PM8. The pins, which measure 7/8" in diameter, have a bendable "tab" rather thank a pin pack. The player photo is printed in blue-and-white. 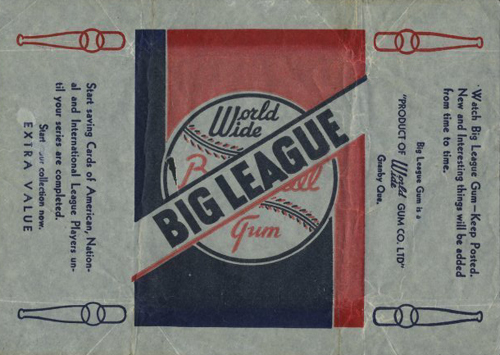 The player's name and team are printed on the bottom. The pins were originally sold on a square of cardboard decorated with stars and stripes, and imprinted "OUR NATIONAL GAME" above the pin, and "A BASEBALL HERO" below. A large number of the pins, complete with their cardboard backing, were found in a hoard in Oklahoma in the early 1990s.